Hi my name is Soham Kathuria and I am from Pune, India. I was recruited to play college soccer here in the USA. Back home, I was voted 3 times MVP in school and 1 time MVP in Secondary school. I was captain of the Pune Football club U-15 team that participated in the Manchester United premier cup(MUPC) while also being the youngest player to play varsity soccer. At 15, I became the youngest player in the club’s history to represent the Deccan 11 football club senior team, a semi-professional team in India. I went to captain my state Maharashtra at the B.C. Roy trophy National U-18 tournament and also played for the Indian national youth league winning club Pune FC U-19 academy. I was also selected to represent my country India at the national U-17 team in Goa. 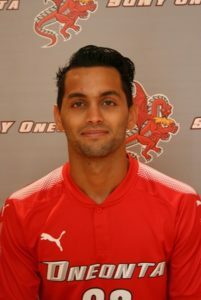 I was recruited to play Division 2 college soccer at the University of Montevallo in Alabama on a scholarship from where I transferred to a college in New York called SUNY Oneonta that were nationally ranked. I have previously played semi-professional soccer in the summer for Birmingham Hammers in Alabama and then played for Duluth FC the past two summers including this one. I have enjoyed coaching in my summers and I am really looking forward to teaching what I have learnt over the years while also having fun playing soccer!